If this were high school, I am not sure Bryan Petroff and Douglas Quint of Big Gay Ice Cream fame would have asked me to sign their yearbooks. I would have admired from afar their insouciance, their use of Bea Arthur and a unicorn licking a rainbow ice cream cone as mascots, and their snarky humor, and then perhaps they would have rolled their eyes that I would have even used the word insouciance. And certainly Petroff and Quint's debut cookbook is going to force you to muster up those awkward teenage years known as high school, for their collection of recipes is designed as a yearbook complete with an introductory letter from Monsignor Anthony Bourdain (Headmaster), somewhat naughty signatures in the front pages of the book, chapters separated out into each class year (freshman through senior complete with class photos in front of a laser-light backdrop), and fake advertisements at the back, including those for eyebrow shaping (by Debi, ask about their prom specials) and a funeral home (Peter Jerema, where they "do coffins right"). Throughout, celebrities (such as one of my favorites Stacy London of What Not to Wear) chime in with testimonials under the guise of the Most Likely To _______ series (Stacy was Most Likely to Succeed). And the science club asides--on such topics as homogenization and ice temperatures with salt--suggest that Bill Nye was on faculty and was roped into sponsoring the club. However, most delightful of all are the class drawings of Bea Arthur and the aforementioned unicorn engaged in typical high school activities, such as the unicorn trying to cheat off of Bea's test and Bea saving said unicorn from choking. This is one cookbook that does not take itself seriously despite the fact that it takes its ice cream stone-cold seriously. 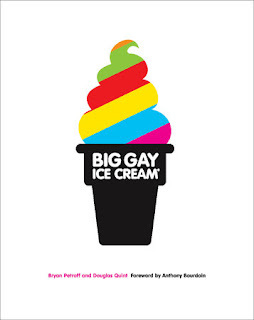 Big Gay Ice Cream got famous from a series of rented ice cream trucks back in 2009, and nowadays they boast four storefronts in New York, Los Angeles, and Philadelphia. It took them six years to publish this book, and they don't expect you to come to the book already an expert in ice cream. In fact, they begin the book (freshman year) with store-bought ice cream but with surprising flavors in their toppings (such as, tarragon, Trix, hot sauce, orange marmalade, saba, lemongrass, and olive oil--just not all together). As each year progresses, you can take harder recipes (or classes), and by sophomore year you're making your own toppings, by junior year your own (boozy) floats and shakes, and by senior year your own ice creams and sorbets. By the end of the book, replete with its PG-13 humor, cheeky recipe introductions, stories of permit acquisitions, and autographed photos, you're ready for graduation. And as is typical, I definitely was nerdy enough to jump straight to senior year, where I beelined to the basic Chocolate Ice Cream. Sure, this is an eggless ice cream in the "Philadelphia Style" (a few pages later boasts a milk chocolate ice cream with eggs), and people have a lot of opinions about the use of eggs in ice cream. The truth is that because of their high protein and fat content, egg yolks add to the chewy creaminess of ice cream. Without them, your ice cream can get, well, a little icy. Which is actually somewhat pleasant when you're aiming for the consistency of a Wendy's Frosty. Plus, there's no hassle with the tempering of eggs to form the custard base (or the risk of scrambling said eggs and having to start anew). I like no hassle from time to time. Especially if it garners me a Frosty. 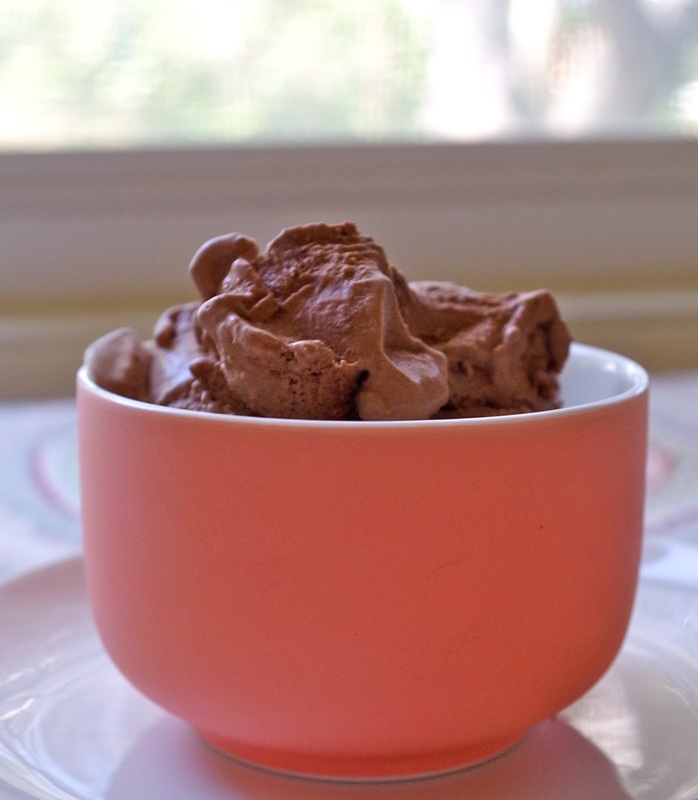 I certainly didn't need this ice cream especially since I am trying to eat a tad healthier, and most people recommend that you eat Philly-style ice cream the same day you make it (and our authors urge us to do so because, really, no one is looking). However, I am happy to have a quart of it (minus one delightful bowlful) in my freezer begging me to take a bite every time I walk by the refrigerator. Luckily, Bea Arthur and the unicorn aren't going rat me out to Headmaster Bourdain. 1. Warm the milk and cream in a medium saucepan over medium heat, stirring frequently, until the mixture begins to steam. Add the sugar and stir until completely dissolved. 2. Warm the chocolate in a microwave for about 30 seconds to melt it just a tad (to get it started for the milk and cream). Add the chocolate to the sauce pan and stir for about 2-3 minutes, until thoroughly combined. Whisk in the cocoa powder and salt until dissolved. Then reduce the heat and cook at a low temperature, stirring for 2-3 minutes to thicken it. Remove from the heat. 3. Transfer the mixture to a 1-quart container, cover, and refrigerate for at least 6 hours. The chilled mixture will be quite thick, so whisk before putting it into the ice cream maker. Freeze according to the manufacturer's instructions. Either eat immediately to get the soft serve experience most compatible with Philly-style ice cream, or freeze for later consumption.